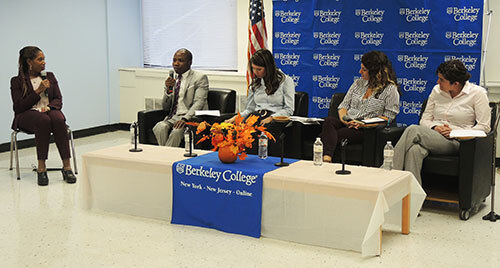 Photo Caption: Professionals with learning, physical and mental health disabilities discuss their unique achievements and challenges in the workforce with students and associates at Berkeley College in Midtown Manhattan, NY, on October 18, 2017. Hosted by the Office of Disability Services at Berkeley College, “Work Matters for All: Personal Stories of Disability and Professional Success” was held in honor of National Disability Employment Awareness Month to enhance consciousness about disability employment issues and celebrate the many contributions of workers with disabilities. Pictured above from left to right are Sharon McLennon Wier, PhD, Director of Disability Services, Berkeley College; Edmund Asiedu, Career Counselor, Career Services, Berkeley College; Amanda Burrill, U.S. Navy Veteran and Journalist; Jes Osrow, Founder & Coach, JOSROW Consulting; Talent Advocate, Hired; and Stephani A. Schendlinger, Esq, Bankruptcy Department, Rosicki, Rosicki, Associates, P.C. 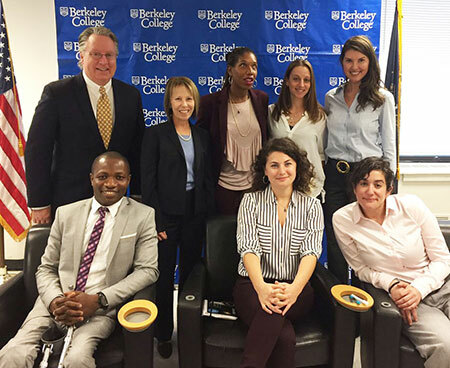 Standing in the below picture with the mentioned panelists are Michael J. Smith, President of Berkeley College (far left); Beth M. Castiglia, PhD, Provost, Berkeley College (second from left); and Danyel Addes, Assistant to the Director of Disability Services, Berkeley College (second from right). To view more photos from “Work Matters for All: Personal Stories of Disability and Professional Success,” click here.